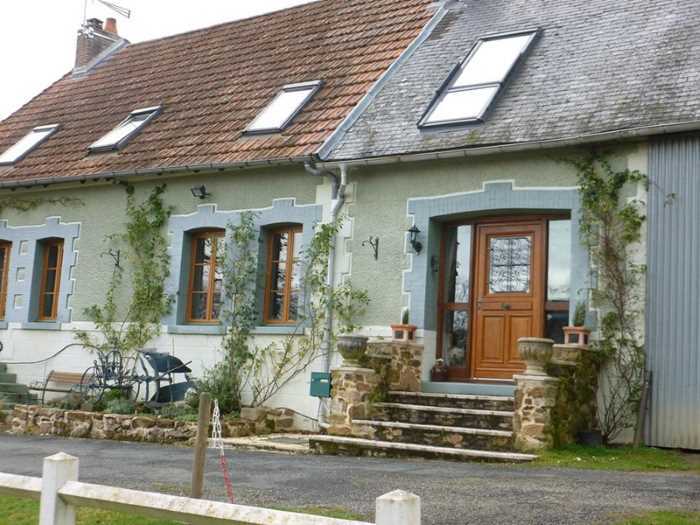 Sits this delightful three bedroom stone house, formerly two mill cottages. 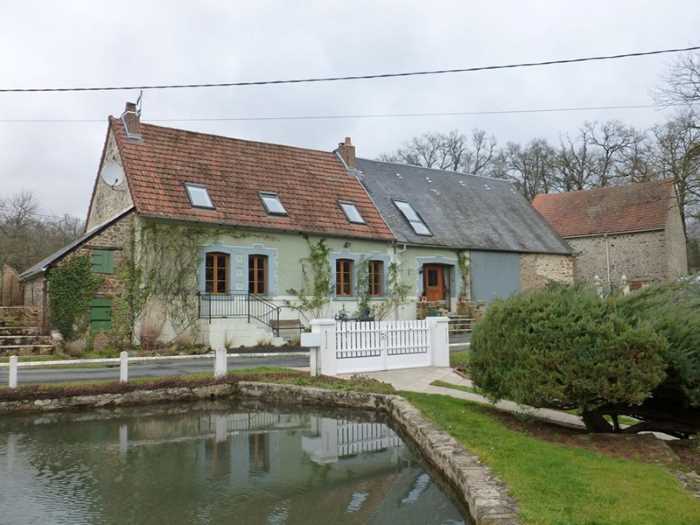 Located in a small hamlet of three houses, it overlooks the old mill (now restored), mill pond and across to woodland giving it a secluded feel but located a five minute ride to the village of Azerables where there is a church, pharmacy, boulangerie, mini market, doctor surgery and various other businesses. It’s ten minutes from junction 21 of the A20, the main auto route running through central France. The lane ends just past the front entrance and turns into a grassed area where there is plentiful parking. On entering the house up the steps, you arrive in a spacious hall with oak beams, oak flooring, an oak staircase up to the first floor and a door into the garage then into the utility room at the back of the house. Both these rooms benefit from underfloor heating. The utility room is fully fitted with a double stainless steel sink. 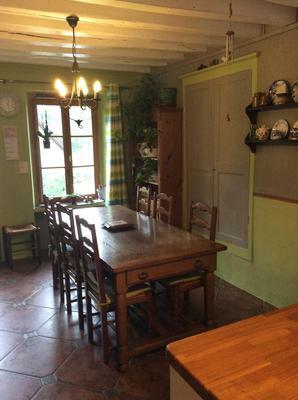 Coming back thorough the hall, you come into the spacious country style dining kitchen with white painted beams. There are two double glazed windows to the front and a patio door to the rear together with a large inbuilt cupboard. There is a wood fired Rayburn which sits in the chimney breast heats the water and underfloor heating and is great to cook on. The kitchen part of the room is fitted with cream units and oak worktop and features a gas hob, electric fan oven and dishwasher. There is also room for a full size American fridge/freezer with plumbing. 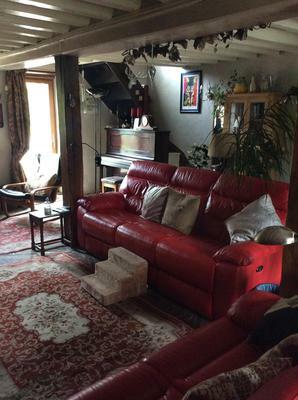 Moving on into the large lounge, there are numerous original features, such as painted beams, original beautiful stone floor, bread oven, Limousin sink, supporting pillars and two inbuilt cupboards either side of the chimney breast. There is a patio door to the rear and two windows to the front, all double glazed. There is a large woodburner in the lounge which heats the radiators upstairs. Upstairs there are three bedrooms. The master bedroom is large with exposed brick chimney breast, a high ceiling, beams, two velux windows to the front, two radiators and the original tomettes on the floor. There is a generous ensuite bathroom with a bath and shower attachment, washbasin, toilet. Bidet and full height radiator. Coming out of the master bedroom onto the first part of the landing with tomettes, there is a second staircase which leads down to the lounge. The second bedroom is also large with exposed brick chimney breast, beams, oak floor, radiator and a velux window to the front. The second part of the large landing with oak flooring gives additional space and there is a door out onto the balcony where there are spectacular views of the garden. At the end of the landing, there is fully tiled wetroom with toilet, washbasin and walk in shower. The third bedroom is at the front and features a velux balcony window, radiator, beams and oak flooring. This is also a cupboard housing the water heater which can be switched between summer and winter water heating, depending upon whether the Rayburn is lit. Outside, the patio runs all along the back of the house with a purpose built gazebo at the end crafted in oak. The beautiful private, fully fenced garden wraps around the sides and the back of the house and measures 3829 m2. There are numerous specimen trees including fruit trees, shrubs and plants and also a large vegetable garden with a section for soft fruit. Just outside the patio door of the lounge, there is an ornamental fountain and, further up the garden a 7x4m above ground swimming pool. On the side of the house there is an attached building with an outside toilet at the back and a storage area at the front. There is an attached stone garage/wood store and across the garden there a large separate stone barn of approximately 12x10.5m, a polytunnel and large ornate gates which give access to the garden from the front. 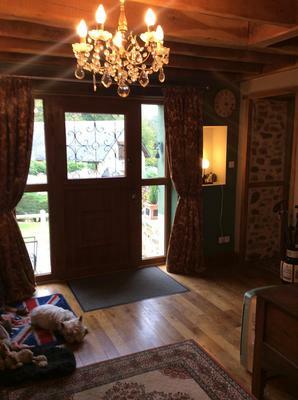 The house has been sympathetically renovated to a very high standard and retains many of its original features. It has a lovely cozy feel to it, is cool in the heat of the summer and warm and comforting in the winter. 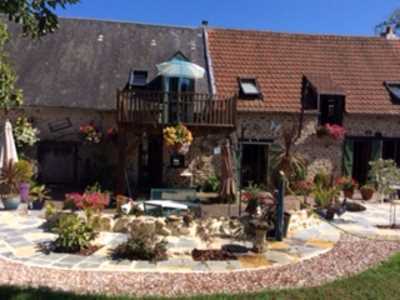 Price €200.000 excluding notaire’s fees.